We are pleased to announce that Provincetown Art Association and Museum (PAAM) was selected to participate in the Barr-Klarman Massachusetts Arts Initiative – as announced on October 3 on the Barr Foundation’s blog. A partnership between two Boston-based foundations – Barr and The Klarman Family Foundation – the initiative is a $25 million, six-year investment in 29 arts and cultural organizations from across Massachusetts. Participating organizations receive flexible, multi-year operating support grants, in addition to training and technical assistance from TDC, a nonprofit consulting and research firm. PAAM’s engagement in the initiative begins with two grants totaling $387,000 from Barr and the Klarman Family Foundation over three years. “As PAAM moves into its next chapter of growth, we are honored to partner with the Barr Foundation, Klarman Family Foundation, TDC and an incredible group of cohorts. It is extremely gratifying to be part of such a forward thinking initiative and we are so excited to begin working together,” said Executive Director Christine McCarthy. PAAM and each participant in this initiative will receive multi-year, unrestricted operating grants. Additionally, through a grant to TDC, a nationally recognized nonprofit consulting and research group, organizations will also receive customized training and technical assistance, and be eligible for supplemental funds for targeted research, capacity building, and/or pilot projects. Last week, the foundations made the first set of three-year grants under the new initiative, marking the beginning of what is expected to be a six-year journey of learning, collaboration, and growth. 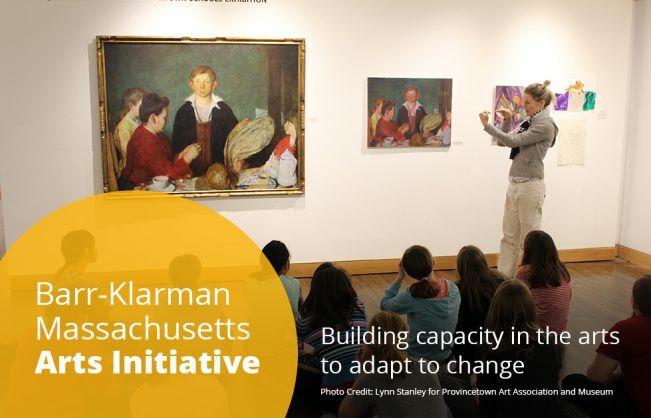 For more information about the Barr-Klarman Massachusetts Arts Initiative page, including the ideas underlying the effort, key elements of the experience for participating organizations, selection criteria, and evaluation findings, click here. The Barr Foundation’s mission is to invest in human, natural, and creative potential, serving as thoughtful stewards and catalysts. Based in Boston, Barr focuses regionally, and selectively engages nationally, working in partnership with nonprofits, foundations, the public sector, and civic and business leaders to elevate the arts, advance solutions for climate change, and connect all students to success in high school and beyond. Founded in 1997, Barr now has assets of $1.7 billion, and has contributed more than $838 million to charitable causes. For more information, visit barrfoundation.org or follow @BarrFdn on Twitter and Facebook. The Klarman Family Foundation seeks to identify areas of unmet need and advance solutions to addressing them. Underlying all of the Foundation’s work is a passionate belief in the promise and importance of creative thinking, strategic leadership and strong organizations to help bring about change. As a way to learn and create greater impact, the Foundation values acting in partnership with other funders. Its work spans regionally, nationally and internationally and focuses on advancing understanding of the biological basis of health and illness; supporting the global Jewish community and State of Israel; expanding access to vital services and enrichment opportunities in Greater Boston; and ensuring a healthy democracy. Established in 1990 by Beth and Seth Klarman, the Foundation is located in Boston, MA. For more information, visit klarmanfoundation.org.